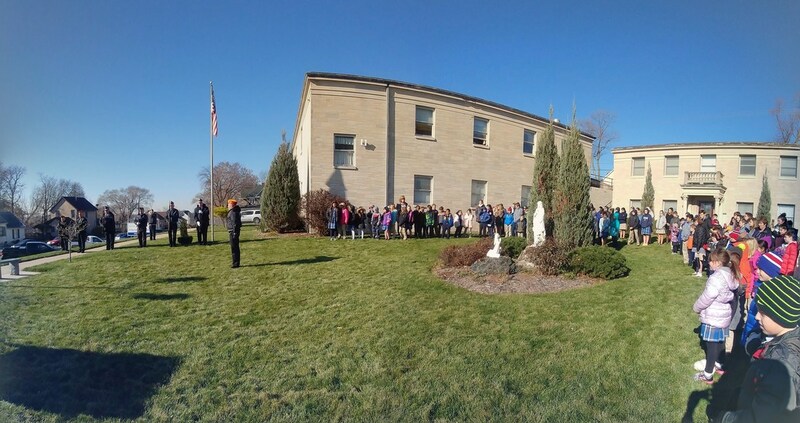 We are very thankful for the Oglesby-LaSalle Veterans Memorial Group for presenting the honor guard ceremonies after our school Mass on November 14th at the Holy Rosary Veterans Shrine. God Bless all who served! There are no Confessions for Christmas Eve or December 26th. 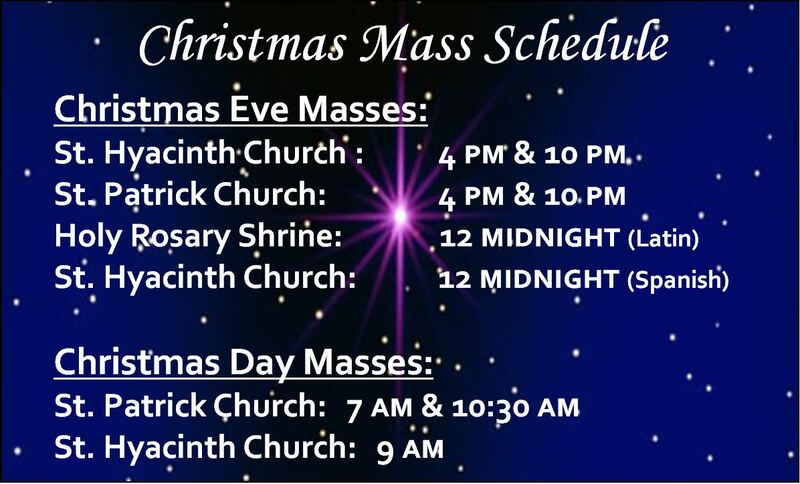 There is no Adoration during Christmas Week. Please return unwrapped gifts to Trinity Catholic Academy or to the Church by Sunday, December 9. Please return gifts to the Church or to the Parish Office by Sunday, December 16. A complaint was made against two former priests who have served in our parishes in LaSalle. Duane Leclercq was stationed at St. Patrick in LaSalle from 1994 until 2003 and is accused of misconduct approximately 30 years ago. John Onderko was stationed at St. Hyacinth in 1962, and from 1965 until 1980 as well as Resurrection from 1993 until 2005. He is accused of misconduct 55 years ago. Both have been retired for over a decade; both have been removed from priestly ministry. A complaint was also made against former priest George Hiland, retired, for misconduct approximately 50 years ago. He was also removed by Bishop Jenky. All priests, deacons, parish staff, and school faculty are mandated reporters and are legally obligated to alert civil authorities to suspected abuse. All those who report past abuse deserve empathy, understanding, pastoral care, and the facilities and resources they require for recovery and healing. Pray through the joyful season of Advent with Saint Clare of Assisi! This compact booklet is perfect for slipping into a pocket, wallet, or purse, to take the inspiring words of St. Clare with you throughout Advent. 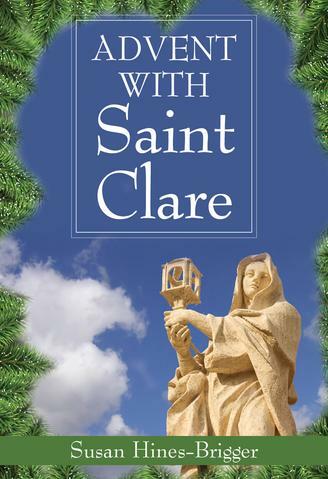 It contains reflections, quotes from Clare and those who knew her, and prayers for each day of Advent. Many thanks to some generous parishioners who donated these booklets. Pick one up in the back of the church while they last! The word Advent actually comes from the Latin word meaning "coming." Advent is a time to "get ready" for the promised coming of Jesus Christ. Advent is a joyous season, but it is also intended to be a period of preparation, much like Lent. Prayer, penance, and fasting are appropriate during this season. These practices help us to empty ourselves of the clutter of daily idolatry and renounce the self love that can so easily squeeze God's grace out of our lives. Advent is not as strict as Lent, and there are no rules for fasting, but it is meant to be a period of self-preparation. The purple color associated with Advent is the color of penance. 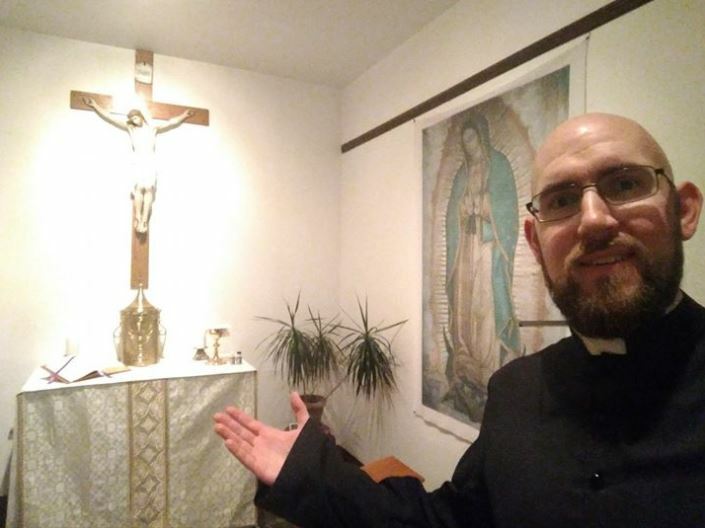 During the first two weeks in particular, making small sacrifices like fasting or making time for extra prayer (and of course receiving the sacrament of Confession!) are good ways to encourage a penitential spirit. The color of the Third Sunday of Advent is rose. This color symbolizes joy and represents the happiness we will experience when Jesus comes again. It is also called "Gaudete" Sunday; gaudete means "rejoice" in Latin. Finally, Sundays during Advent, just as during Lent, should not be given to fasting and penance, but instead to celebration. After all, we celebrate the resurrection of Our Lord every Sunday! St. Hyacinth is open all day 5am-8pm for prayer and veneration of the image. NO Adoration at Holy Rosary today (but the Shrine is open for private prayer). Confessions as normal at Holy Rosary from 7-8pm. Mass for Our Lady of Guadalupe 7pm at St. Hyacinth. TCA-RE Families: Remember, there are no catachism classes on Wednesday November 21st because of the Thanksgiving Holiday. We made the front page (again!). 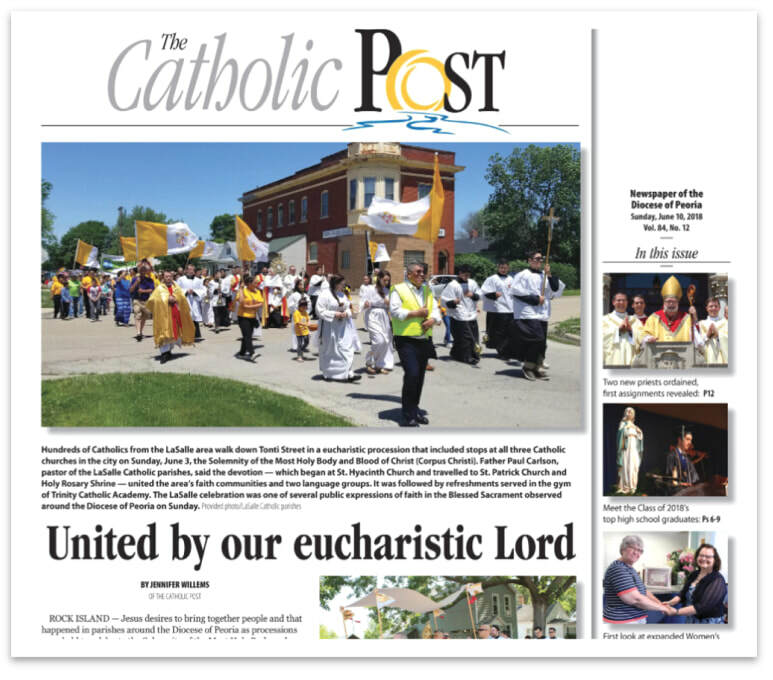 Please be sure you renew your subscription to the Catholic Post. Click here for the Post's web page. 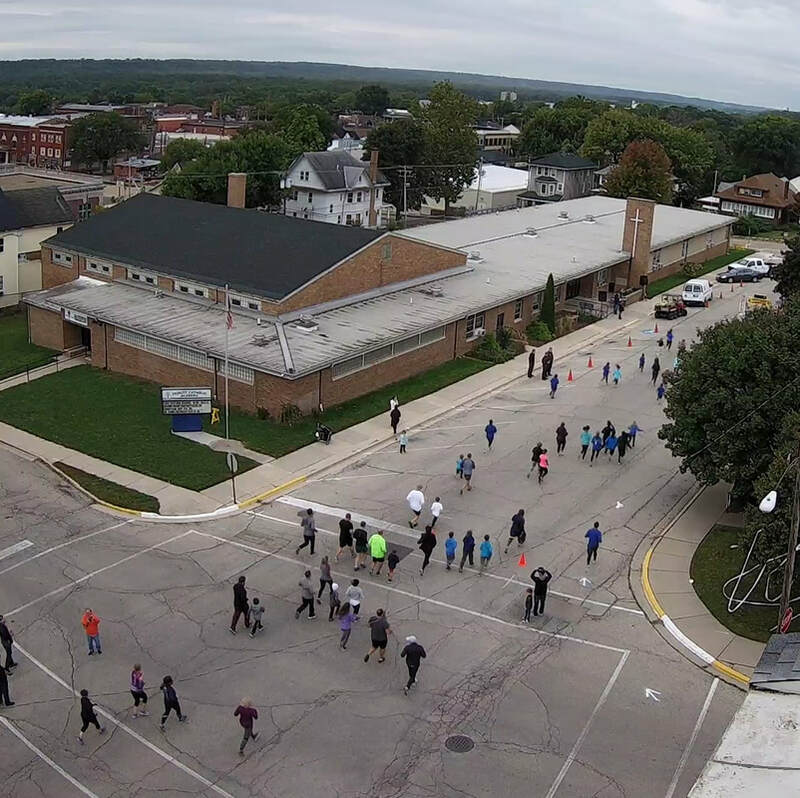 A huge thank you to all who came to accompany the Lord through the streets of LaSalle last weekend. We had a fantastic turnout, with well over two hundred people joining the procession. We are especially grateful to the following people and organizations who played an important role in the procession and festivities: the 24 Altar Servers, First Communicants, Father Rose, Father Blake, Deacon Montenegro, Deacon Guerrero, Deacon Fischer, Seminarian Taylor Caputo, Ladies of the St. Anne Sodality of LaSalle Parishes, Comité Hispano, Grupo de Oración, Conquistando Naciones Para Cristo, Legion of Mary, the City and Police of LaSalle, Volunteer Church Cleaners and Sacristans, and members of the Youth Group. Many thanks to everyone who ran and supported our 5K run. We had great cool weather! Special congratulations to Dan Palmer, our top male finisher and Candis Kenny, our top female finisher. We're proud of all our TCA students who came out for the race. Our top male runner is Mikey Hartman and Maggie Arkins was our top female runner. TCA Annual Spaghetti Dinner will be Sunday October 28, 2018 from 11:00am to 2pm for sit down or drive up and then from 4pm to 6pm drive up only. Please come to the school gym. Cost is $8 per adult Children 10 and under are $5 Dinner includes-famously delicious Spaghetti, Salad, Bread & Butter, Dessert, & Drink We will have a Bake Sale, 50/50 & Early bird Cash Raffle drawing for $1000 at 2pm. We are excited to announce that Bishop Jenky will be administering the Sacrament of Confirmation to our candidates at the Cathedral of the Immaculate Conception in Peoria on October 7th, 2018. Candidates are encouraged to begin their preparations this summer. Please keep them in your prayers. 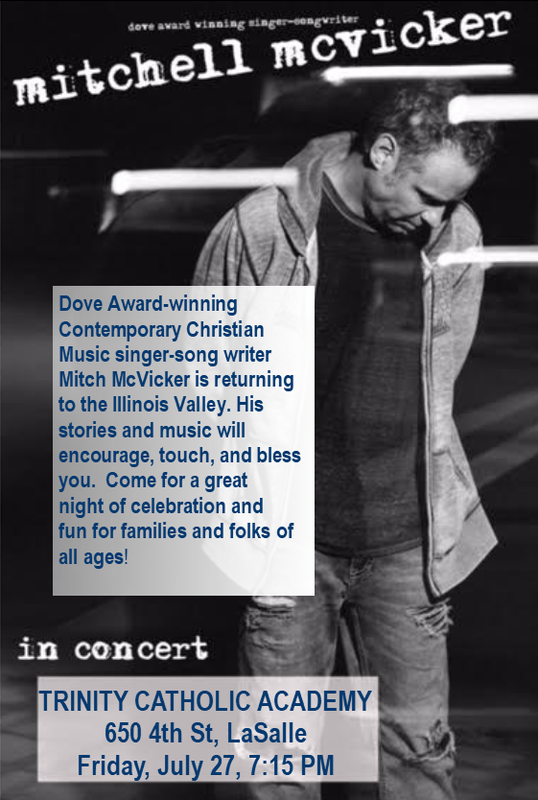 ​Saturday, September 15th at 7 PM, Holy Rosary Shrine in LaSalle, IL. Missa Cantata with Procession and Benediction. Light refreshments to follow in the basement of the Shrine. On Wednesday, September 5, there will be a meeting in the school gym from 4:30-5:00 p.m. for parents of all RE students. Parents will visit classrooms and meet the teachers from 5:00-5:30 p.m. Additionally, there will be a meeting in St. Patrick Mother's Chapel from 6:30-7:00 p.m. for parents of 8th grade students preparing for the Sacrament of Confirmation. Religious education classes for public school students grades 1-8 began Wednesday, August 29. Classes meet on Wednesdays at Trinity Catholic Academy from 4-5:00 p.m. at Trinity Catholic Academy. Parents are reminded that students are required to attend the two-year program when preparing to receive the Sacraments of ​First Holy Communion and Confirmation. More information and forms are available here. We are excited for our next year of TCA-RE! The Annual St. Hyacinth Bazaar is on Saturday, August 11, at 5:00 immediately following the Polka Mass. We are looking forward to a night with family and friends with food, drinks, games, and live entertainment. Volunteers are needed to help work the night of the Bazaar. This is a great opportunity for students who need volunteer hours for Confirmation or for High School students. Parishioners are welcome to bake or donate cupcakes for our ice cream social. All coaches of TCA athletics are asked to attend this event with Fr. 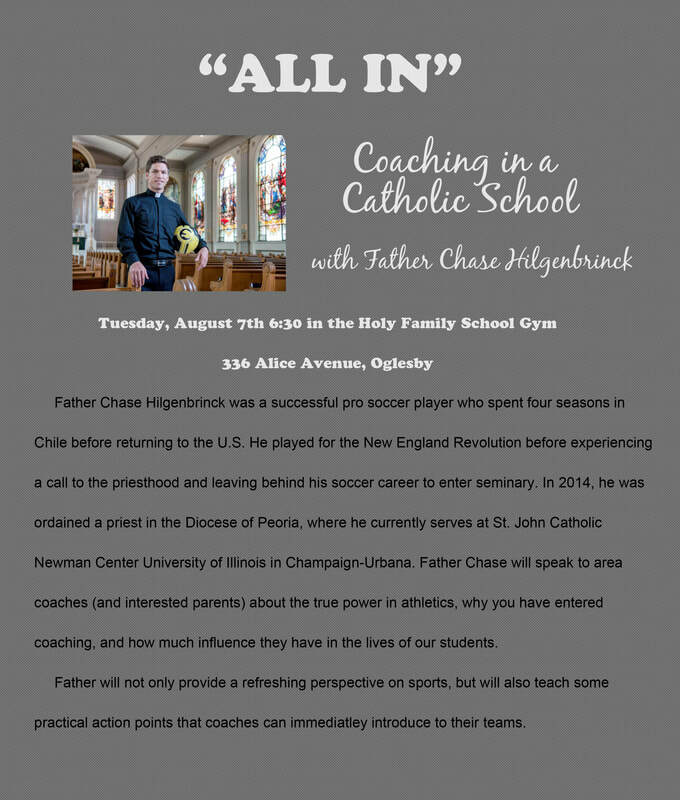 Chase Hilgenbrinck at Holy Family school on August 7th. All available and interested parents of student athletes are also welcome to attend. Fr. Chase has an important message for how athletics, and specifically coaching, can positively impact our young Christians. See you there! Summer Ministry Schedules are Ready! Take a look at the schedule page to see the current volunteer schedules. Please let the office know if you need a change. Totus Tuus, our annual week-long Catholic summer program for youth, will be in the LaSalle Parishes from July 1 - 6. This diocesan sponsored program is a fun, spiritual week that allows kids to reach a deeper level of religious education through catechesis, prayer, celebration of the sacraments, and fun! meet Monday through Friday 9:00am - 2:30pm. meet Sunday through Thursday 7:00pm - 9:00pm. Drop off is at Trinity Catholic Academy (650 4th St., LaSalle). Financial assistance available - contact the church office. 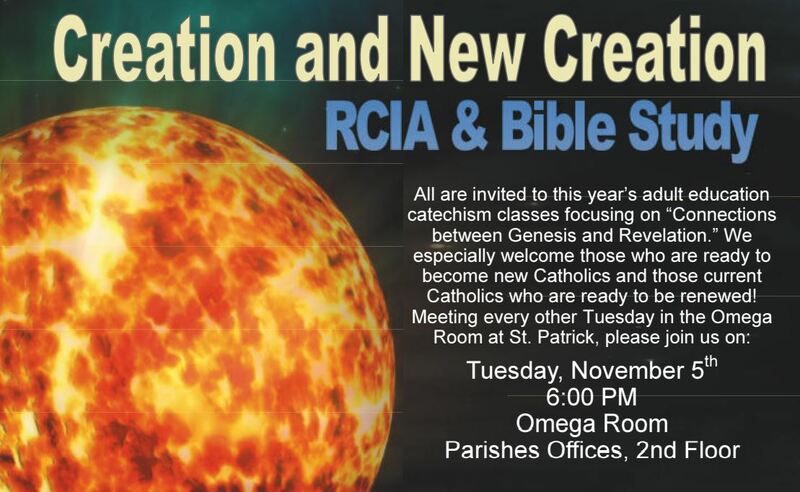 Donations to help defray the parishes' cost of this program are greatly appreciated. Pre-Registration is not necessary, but the form is available below to save some time on the first day. We have 20+ salvaged pews for sale. Approximately 9.5 feet long and 22 inches wide. Nice detail and in pretty good shape. $150 each. ​The pews come from the mission church of Sacred Heart in Dimmick that was closed some time ago when it became unsound. ​Contact frcarlson@lasallecatholic.org or the parish office to take a look or pickup. Sale ends this month! Proceeds benefit St. Hyacinth Church. No Confessions this Monday at the Shrine. Please come on Wednesday at 7pm or call the office to schedule a time. 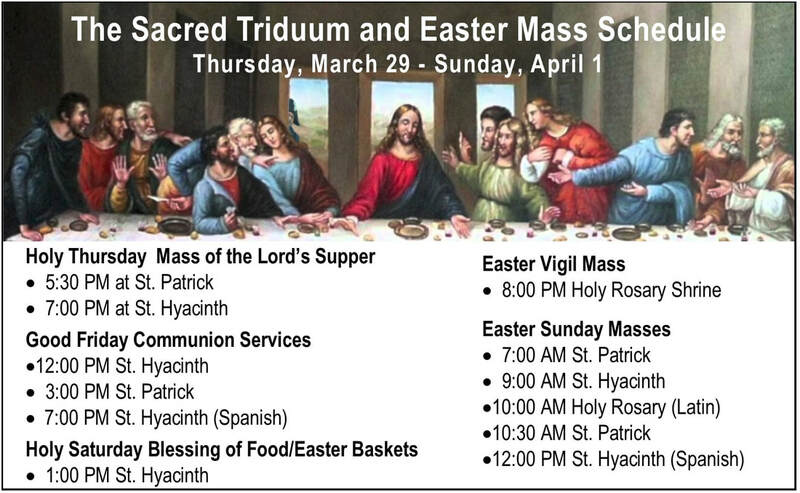 7am Mass on Tuesday and Wednesday will be Communion Services. Please come at the regular time. The Parish Office is only open in the afternoon this week. Please call or stop by Noon-5pm Monday through Thursday. 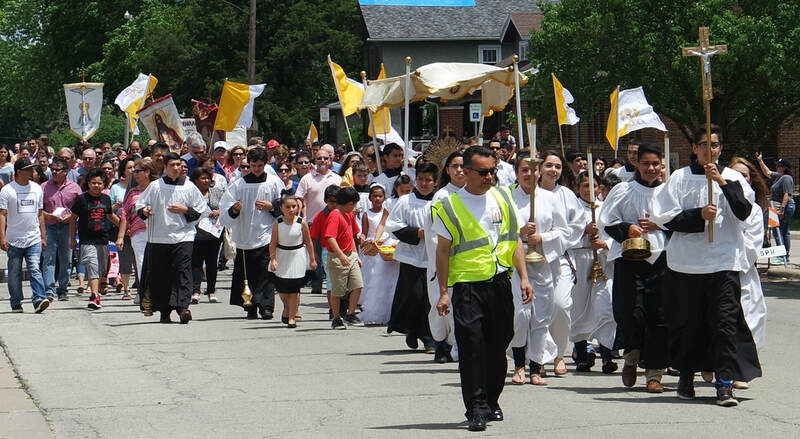 Come Join the Corpus Christi Procession! ​Come and join us for a traditional Corpus Christi procession on June 3rd! We will begin after a bilingual Mass at St. Hyacinth Church. About 12:50 p.m. we will have Benediction and begin a procession to St. Patrick. After Benediction, at the porch of St. Patrick, we will continue the procession to Holy Rosary Shrine for the third Benediction. If you are unable to come for the noon Mass, simply come to St. Hyacinth Parish a little before 1 p.m. If you don’t think you are able to walk the full route, drive to St. Patrick Church at 1:15 p.m. and join us there for the procession to Holy Rosary. ​Parish Organizations will have their banners, and First Communicants are encouraged to wear their suits and dresses. Wagons and strollers are certainly welcome and appropriate! Refreshments and lunch will be available after the procession at the TCA gym. In case of rain, we will process inside St. Hyacinth. Processions are an important tradition in our Faith. That is why Mass always begins with a procession. It reminds us that as Christians we have a purpose, we have a destination, and that we are all on pilgrimage through this life. Don’t miss our procession this year! 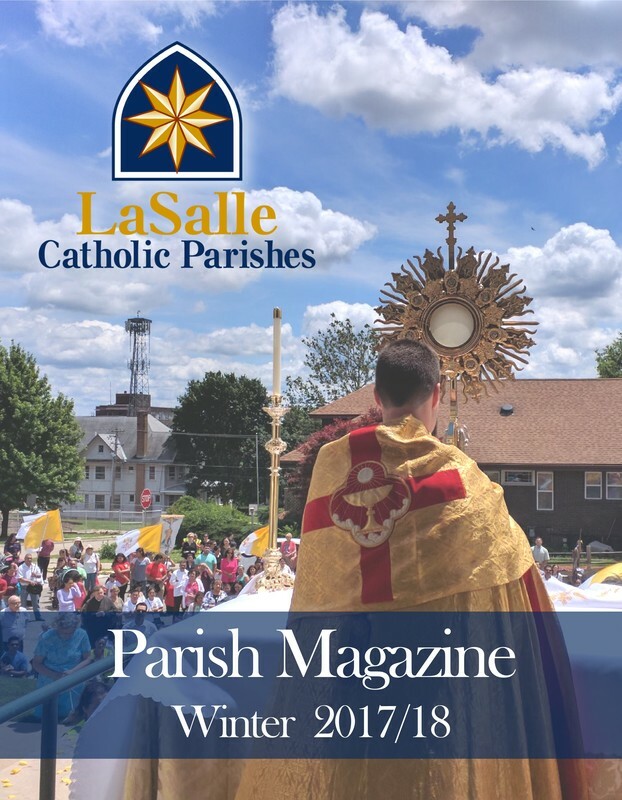 LaSalle Catholic Parishes Magazine: The first edition of the Parish Magazine was mailed out to all parishioners on December 14. If you did not receive your copy, please pick up a copy in the back of the church. If you would like additional copies for family or friends, please stop by the parish office. Often we find there just isn’t enough space in the bulletin for everything our parish family has to share! The magazine tries to bridge that gap. School Spirit Wear - Now on Sale! Let us Exult! Christ is Risen! 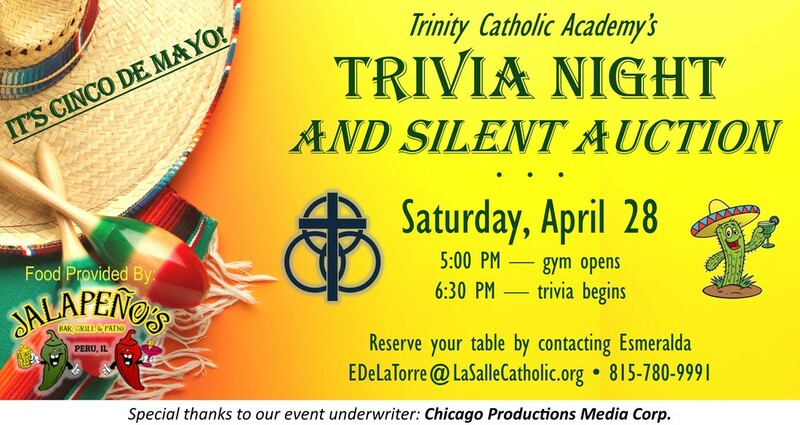 Enjoy a fun night out as our school gymnasium is turned into a Mexican fiesta with music, beverages, food provided by Jalapeño's Bar & Grill, silent auction, amazing raffles, and, of course, trivia! Prizes are awarded for 1st, 2nd, and 3rd place winners. Cost: $100 per table, up to 10 people. All proceeds support Trinity Catholic Academy and help reduce the cost of tuition. On August 31, 2017, Governor Bruce Rauner signed into law the “Invest in Kids Act,” a comprehensive education funding bill for Illinois. By first registering with www.MyTaxIllinois.gov, donors can make a contribution to www.EmpowerIllinois.org (independent from the State of Illinois) with their donations designated to support Trinity Catholic Academy. Empower Illinois is a scholarship granting organization that grants financial assistance to families in need to attend private schools like Trinity Catholic Academy. In response, the State of Illinois is granting a 75% tax credit for these contributions. For more information, visit www.cdop.org. Please click here to go to the online schedule page. We are excited to announce that the 2018 pilgrimage to Italy has been scheduled for next spring. If you have not been to Rome before, please especially consider coming to visit the Eternal City, to visit the tombs of Sts. Peter and Paul, and to explore the Catacombs of the early Christians. If you have already been on one of the LaSalle pilgrimages, this will also be a great tour for you as this year’s itinerary will include many cities and holy sites that we haven’t visited before. We will begin in Venice, and travel by coach through the Italian countryside to Rome, stopping to visit Padua, Florence, and Siena. The dates are after Easter, when Italy is warming up, but before the tourist season: April 9th-18th. ​45-minute video presentation by Dave Ramsey. Discussion hosted by Hueneburg Financial Group. and allow your finances to bring you peace. $5,300 average debt paid off in first 90 days! $2,700 average amount saved in first 90 days! In preparation for our celebration of Catholic Schools Week, we are excited to offer an “I ♥ TCA” essay/monologue competition for all our school children, from preschool through eighth grade, to participate in. There will be two winners from every grade level, as well as prizes for the overall first and second places winners. Please note that some teachers may be making this contest a part of a classroom assignment, while other teachers may be leaving this to the students to complete at their own discretion. Contest details are attached below and all entries are due Wednesday, January 10, 2018.